Someone Made A Horrifying Snowman That Is Straight Out Of A Nightmare ???? 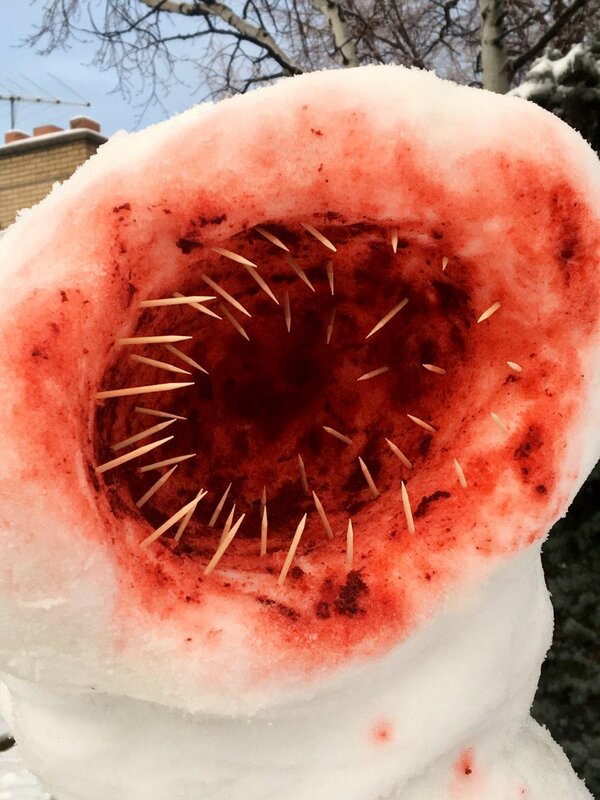 Residents in a neighborhood in Utah were met with a terrifying sight this week in the form of a multi-limbed, bloody-mouthed snow creature leering from the side of the road. The monstrosity was created by Zack Frost, a 26-year-old freelance artist, and his 19-year-old sister Emilie, who wanted to “make something cool and hopefully creep out the neighbors”. They decided to channel the works of HP Lovecraft. Twentieth century author HP Lovecraft is famous for creating a universe filled with horrifying inter-dimensional beings waiting to return to Earth. The Frosts’ twisting beast has 16 twigs for arms, three rows of needle-like toothpick teeth and a gaping maw covered in “blood” made from red food coloring, chili powder and water. Zach tweeted pictures of the snow-worm after making it on Monday and the post has been shared tens of thousands of times. “The best part is that I’ve seen a lot of people tagging their friends and saying things like ‘We’re doing this’. People shared mixed reactions to the pairs efforts. Although the Frost siblings don’t have any designs for a menagerie of melting monsters on their front lawn, they’re not ruling anything out.